Not all graffiti is considered vandalism, some is pure art. So is the mural wall at the Asylum Seeker Resource Centre in Footscray, Victoria. In honour of Malcom Fraser, celebrated muralist, Heesco was commissioned to paint a huge portrait of the late former Prime Minister. 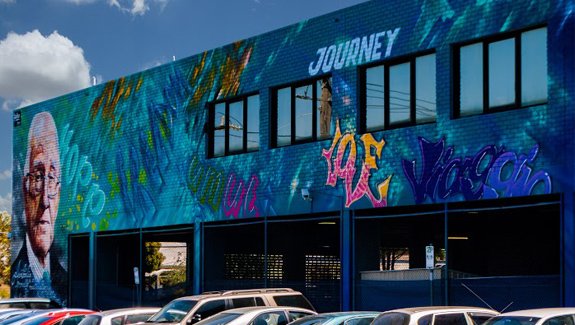 Asylum Seeker Resource Centre in Footscray was established to assist immigrants who have fled from personal prosecution in war-torn, economic instable countries. The centre assists through community & legal support, health & aid services, food and accommodation, skill training & employment. It took five street artists – Heesco, Dvate, Conrad Bizjak, Mike Makatron and Duke Styles, five long days to paint the 100-metre long wall that spans the ASRC, plus about 50 metres of wall belonging to the adjacent Ethiopian restaurant. Once the mural was completed, it was clear that the artists and the organisers wanted to protect the artwork from graffiti tags. Tech-Dry No More Graffiti was chosen as the most suitable product to do this job. Tech-Dry No More Graffiti is a sacrificial wax coating, which forms a clear thin film over the surface to protect the wall from graffiti paint and other staining materials. This coating allows easy removal of tags, general graffiti and other unwanted staining, with no negative effects to the artwork or wall underneath.